Tips on how to use less plastic and reduce the amount of plastic waste from your kitchen without giving up convenience. Plastic has become a product of daily convenience. From plastic drink bottles and disposable plastic bags, to plastic takeout boxes, we all use disposable plastic items to make our lives easier. Plastic is cheap and durable, which is why it is used so often. But it comes at a price. Despite being (mostly) recyclable, plastics often end up thrown out. In fact, only 9% of plastics are actually recycled. That means 91% of all plastics end up in a landfill, ocean or as litter on the side of the road. That’s problematic. Not only can this kind of litter harm the environment and our food sources, but it’s rapidly filling up landfills. It can take up to 400 years for a plastic bottle to decompose. Yikes! In honor of Earth Day coming up, I’ve put together some things that you can do at home to help reduce the amount of plastic that gets thrown out. While recycling is one way to reduce plastic waste, another is to simply use less plastic in your home. With these tips, you can help the environment by using less plastic, without giving up convenience. I can’t be the only one that used to have an ever-growing pile of plastic grocery bags. I made the decision to stop that soon after living on my own, mostly because I hated how fast they collected. I keep canvas grocery bags in my car so that I have them handy when I shop (which is often), and place them back in the car after I’ve unloaded my groceries. If you forget your bags (it happens to all of us! ), ask the grocery bagger to use paper bags instead of plastic. While we’re on the topic of grocery shopping, ask yourself if you really need the plastic produce bags you’re using. Bananas, a bunch of kale, and a single mango don’t need their own bags. The ones you do use can usually be brought back to the store to be recycled. Stasher re-useable food storage bags – take snacks to go, store leftovers in the fridge or freezer, and wash them in the dishwasher! Glass containers – I use glass Pyrex containers for leftovers, meal prep, and cut up produce. They are dishwasher and microwave safe, and they stack great. Mason jars – I love mason jars for storing sauces, spices, and other things that I store in the refrigerator doors, like flaxseed, yeast, and my sourdough starter. They last FOREVER. Food Huggers– These silicone circles are the perfect way to store that half onion or put a top on half a can of chickpeas. They come in multiple sizes (there is even one for an avocado! ), and even have larger ones that fit on top of bowls to store leftovers. PlanetBox lunch boxes– These bento-style boxes are made of aluminum and have convenient spaces for a variety of foods so you can easily pack a lunch or snacks for yourself, your spouse, or your kids without plastic baggies. Etee food wraps – these cotton and beeswax wraps function just like plastic wrap (but better! ), but are plastic-free and reusable. They also make sandwich bags and lunch bags. Does anyone NOT walk around with a bottle of water anymore? Make this healthy habit healthy for the environment too by using a glass or stainless steel water bottle that you can refill as needed instead of tossing multiple plastic bottles a day. Did I miss anything? 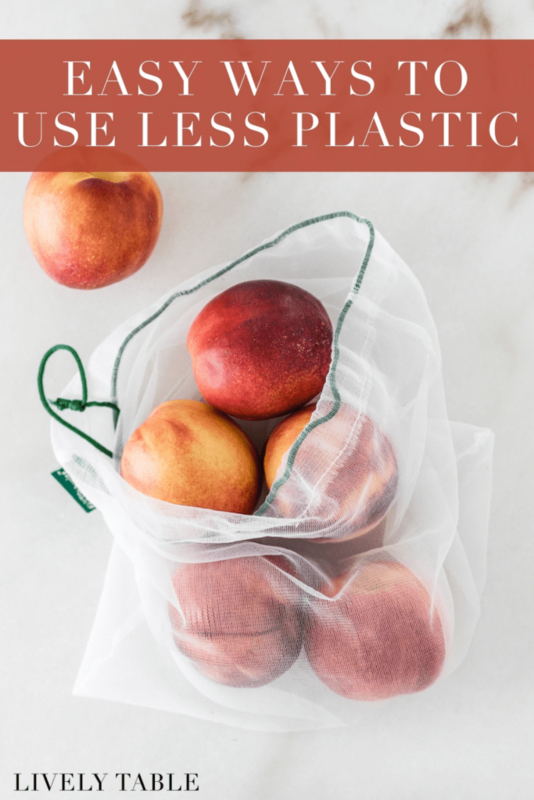 Let me know your favorite tips on using less plastic in the comments below! I no longer use plastic straws; it’s just one little difference; but it all helps! That’s right! Every bit makes a difference!